No. Really. Spoilers are ahead. Do not go past here unless you’re fine with reading spoilers and graphic depictions of horror. Something sinister is brewing in the deceptively sleepy town of Hinamizawa. Keiichi Maebara is new in town, and right from the start, things were already more than a little strange. When the words “hacked” and “cut the corpse into parts with an axe” start to appear in the BEGINNING of the series, you know that this story can only get, well, choppier from here on out. If you’ve never heard of the series, you’ve probably at least heard about the Higurashi nail ripping scene. For reasons that tread into spoiler territory, Shion Sonozaki is forced to atone for her grievances against the family in a perfectly reasonable way: by removing three of her fingernails with one of the most ominous-looking metal devices ever. Rena is the adorable waifu character of the series, right? She’s always offering to feed her friends delicious food… and the juxtaposition between happy-cute Rena and seemingly MAGGOT-INFESTED-SKIN Rena is almost too much to handle. Even as an audience member, you may find yourself scratching at your own skin after these scenes. Yandere of the century Shion has seen fit to go into the psychotic deep end and kill her twin sister’s friend in front of her. While Mion begs on behalf of her friend, Shion mercilessly stabs her victim while they’re chained to a wooden cross. The worst part of this Higurashi death? That horrible stabbing sound effect paired with maniacal screams and laughs. There’s something very eerie about the way Rena calls Keiichi a liar. One of the creepiest scenes from the series is when not-so-waifu Rena tries to force her way into Keiichi’s house to feed him. In what could be interpreted as the most aggressive eat-your-vegetables campaign ever, Rena tries to force her way beyond the chained door, and Keiichi proceeds to stop her with great fervor. 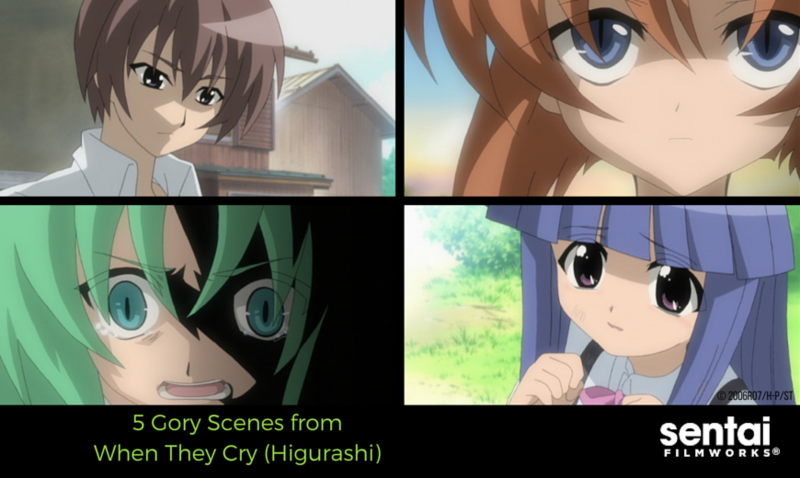 In horror anime, there are regular suicide scenes, and then there are Higurashi suicide scenes. In yet another infamous scene that transcends the series itself, a character escapes torture by planting a knife against a wall and bashing her head against it. This scene, of course, is made infinitely worse when punctuated by Shion’s crazy evil laughter. Seriously, why does the WAIFU character randomly have a readily available machete?! Despite the gore that the show is known for, you have to watch it for the intrigue behind this bone chilling mystery. This fan favorite anime drama from 2006 is ready to become a part of your collection! Order your copy of When They Cry, When They Cry Kai, and When They Cry Rei today, and don’t forget to share images of your anime library with us on Instagram and Twitter!